Since Spring is in the air, we've been perusing the web in search of inspiration to get our homes in ship shape for spring. We found these amazing clean kitchens and founds lots to learn from how they've been styled. Kitchens don't just have to be functional, they can be canvases for interesting displays. We love these beautiful and clutter-free styling and kitchen organizing ideas. Let them inspire you to organize your kitchen space with these take-aways. 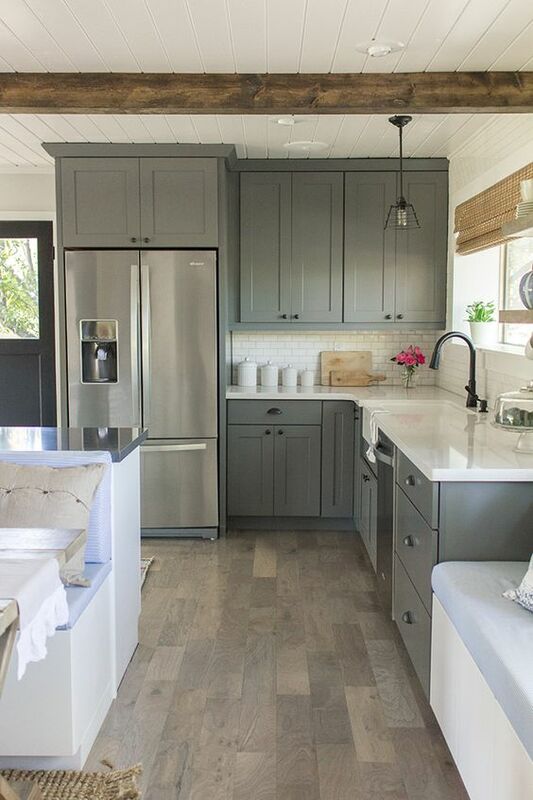 This lovely kitchen from House of Turquoise is not only feminine and well-appointed, but it is strategic about what is placed on the countertops. Note the cute pink cupcake platter that stands alone amidst a clutter-free countertop. What cute little thing could you pull out to work with? One thing that we noticed again and again in the styling of great-looking kitchens was the placement of fresh fruit and flowers. Personally, I love to use a fishbowl with short-cut flowers as the only decoration on our kitchen island but I'm thrilled at these looks too. Who knew lemons were your best friend? If friends are coming over or you're planning to entertain, fresh flowers and citrus definitely adds warmth and a natural vibe to your kitchen. 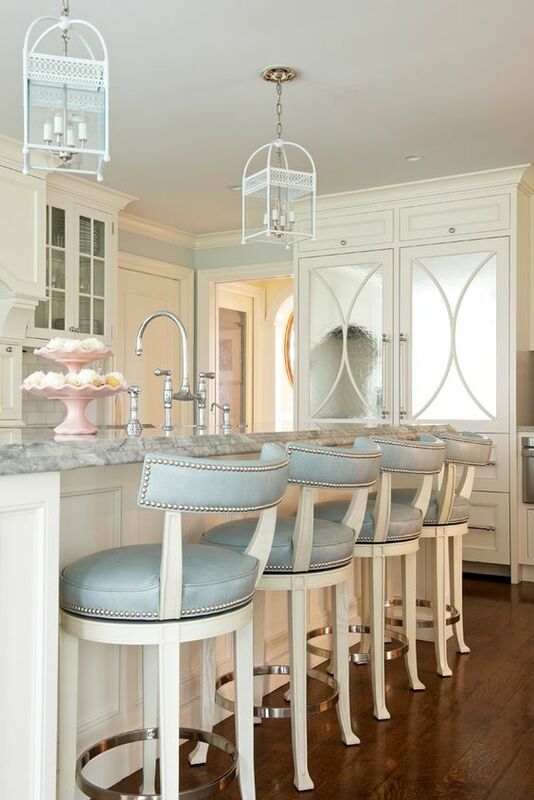 We love how interior designer Susan Greenleaf styled this island. Look how TwoTwentyOne styled their flowers (in this case foliage) and fruit. Super cute! Ikea is a great place to get those small white pots and plants. 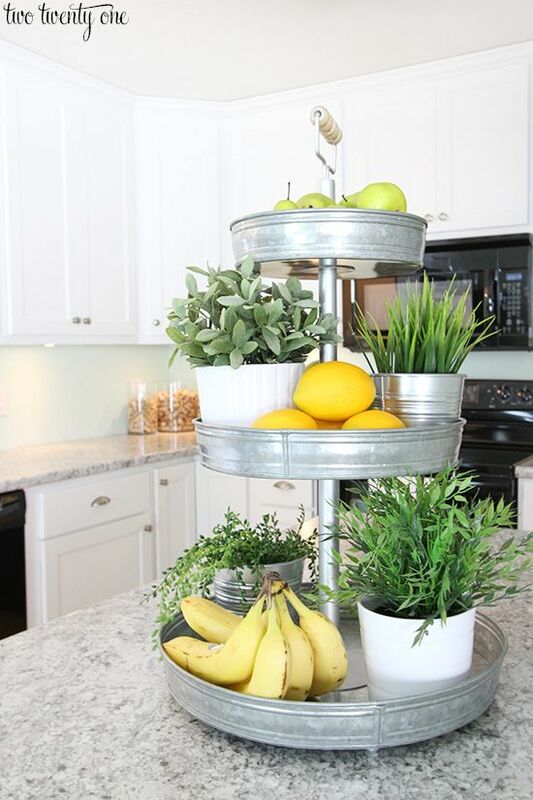 Paired with the fruit, this arrangement not only looks great, but it makes singular focal point, similar to the pink cupcake stand we previously saw. Okay, so we all have them but how should they best be arranged, if at all? 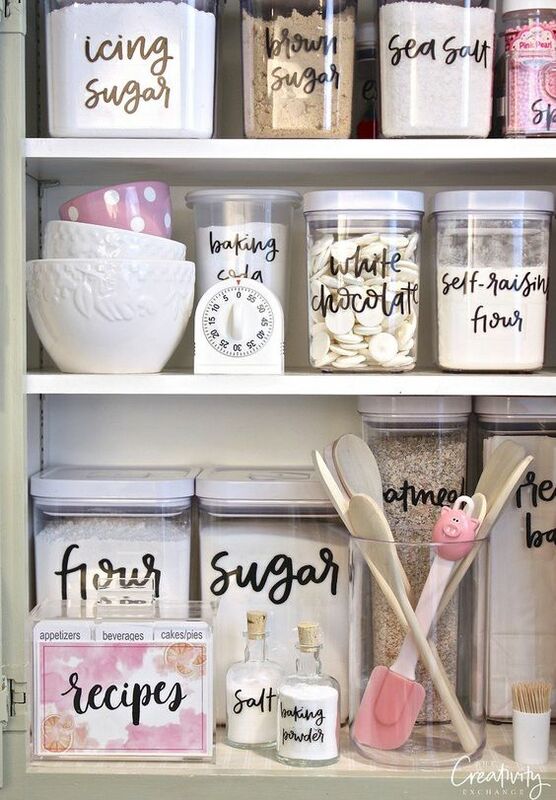 Our jaws just dropped when we saw this fabulous pantry with DIYclear sticker labels by Zuer Designs, which she offers free on her website (you simply download the design and then will need to print them onto clear sticker labels - she explains on her website here). Note also, the careful color palettes. Pink is clearly the accent color. Here is a simple way of arranging countertop canisters, as arranged by Jenna Sue Designs and we like how the cutting boards are also arranged. Note, how the fresh flowers are again in play. These are amazing kitchens and no matter what our budget is, we can take some of these ideas and make them out own. 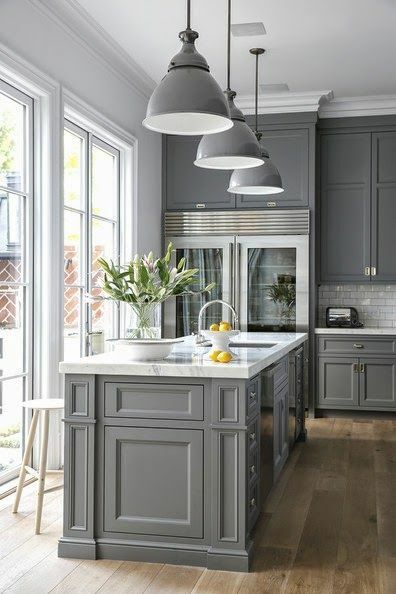 Check out more inspiring clean kitchens at our Clean: Kitchens" pinterest board here.